Time for another empty tease by Sly. More likely trying to get his Creed 2 fee bumped up. Jox, did Dolph talk to you about EX4 recently (I don't know if you talked to him recently)? Is he open for EX4 and did Sly already approach him? I spoke with him recently but EX4 really wasn't on the table and he didn't even have the CREDD II script or storyline then. Sly seems to be getting ideas going, but it's probably 4-5 months from getting really "a thing"... If that really starts getting serious, Nu Image will kick off pre-sales in May at the Cannes market, and the script might not be ready until 2-3 months later. Dolph will hear things but nothing serious until the last minute... If his role or the script isn't strong enough, he might have second thoughts about doing it this time though. Curious, especially coming after recent revelations of safety on stunts being intentionally negligent on sets like True Lies and Kill Bill for nefarious reasons. 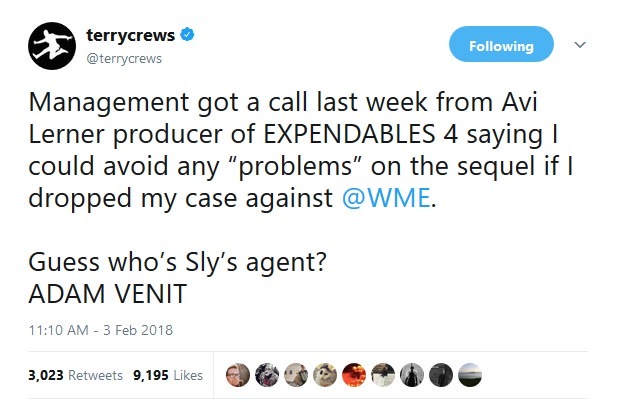 For those unaware, Adam Venit is the William Morris agency suit whom Terry Crews is suing for sexual harassment... And Sly's agent. TheArnoldFans just got confirmation with The Expendables co-star, Randy Couture, that Expendables 4 starts filming this August. “I’m excited about Expendables 4," Couture behind. "Right now, we’re scheduled to start filming in August and hopefully we’re able to stay on schedule. It sounds like we’re coming back to Bulgaria, which is exciting. I’ve spend a lot of time in Sofia and Varna and I’m excited to come back. I love the people (there), I love the food and I’m excited to come back." Just to be safe I'd like to hear about it from somebody other than Couture. Moltisanti wrote: Just to be safe I'd like to hear about it from somebody other than Couture. "No words from anybody. Nothing. Believe me, nobody saw that coming. Nobody thought that I was gonna put that out there," Crews told BuzzFeed News of the tweet about Lerner. "People don't understand that Hollywood is a very violent place. The best way to put it is that it's like a plantation. You use extreme violence. You see a lot of people who never work again," he said. "For even speaking up the whole thing is that they cut your head off so that the next person doesn't speak." As for what will come of his fight against Venit, Crews says he knows he's risking consequences — but is fine with it. "What I've been doing is just exposing. If this is the end of my career, just end it now. 'Cause I'm gonna keep living, I'm gonna keep doing my thing," he said. "But if I don't do another 'Expendables,' then let's not do another one. I'm OK with that." Regarding EX movies he says he's okay if he doesn't make another one. I didn't appreciate the fact that he had begged Sly not to kill his character in EX3, but now I have more respect and empathy for him. Not that any of the characters were exceptionally well written but Crews character was just one I didn't care much for... a lot like randy they are there just for window dressing. if they go ahead with a 4th it needs to focus on the guys who it should have focused all along on. sly,bruce,arnie,dolph,snipes,mel... guys that spent the better part of a couple decades being action heroes. expendables SHOULD have been a love letter to the age of the action hero... instead it was campy schlock with a high kill count. of all the performances in the 3 movies I thought mel hit the perfect tone for what SHOULD have been the expendables series. but to be honest outside of mel and banderas in the 3rd movie... i have little to no interest in ever seeing another expendables movie. sly just went too much for the laughs and let the premise get a little too silly in the long run. also I'm not sure dolph will even need to do an ex 4 if this year is going to be as good for him as i think it is. aquaman and creed 2 should put him firmly back on the map more so than I had thought the first and second expendables were going to do.